Do you have a bag of treats in every room in the house in order to find your cats? 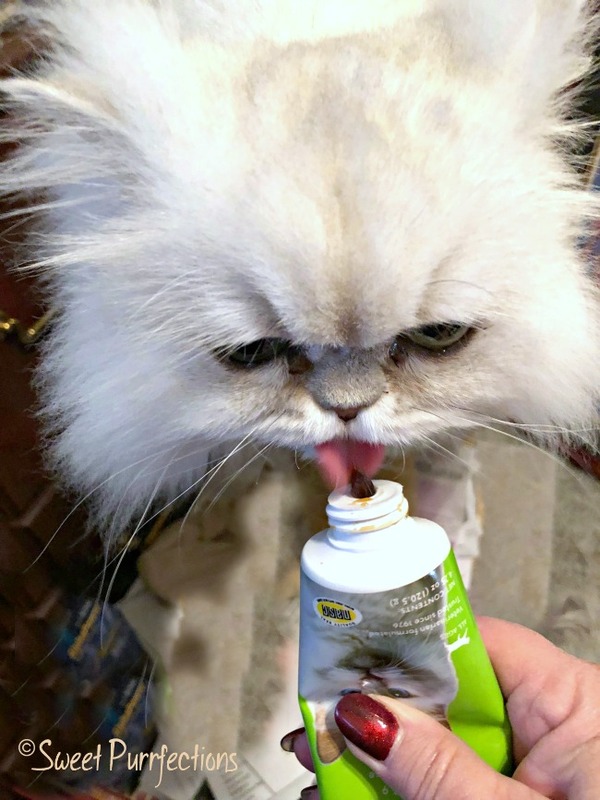 Do you have a variety of flavors and textures so your cat doesn't get bored? 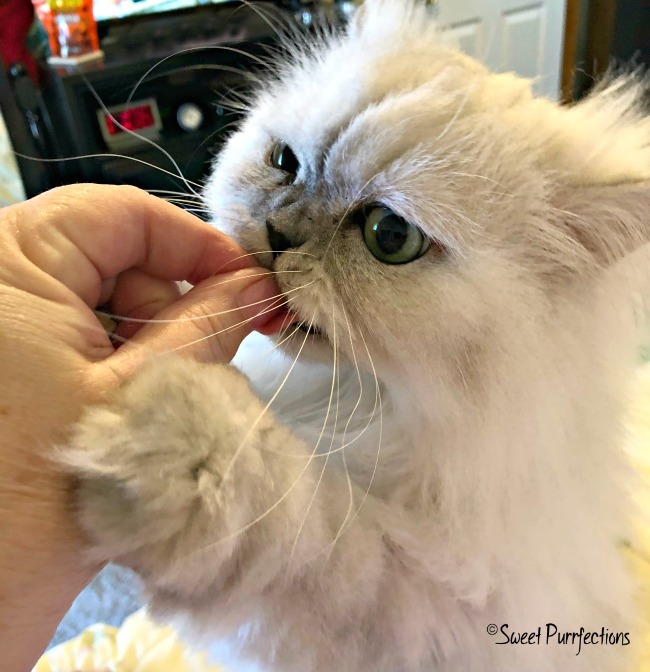 If so, you probably have a cat who is treat motivated! Truffle and Brulee are very motivated by treats! I have at least one type of treat in every room in my home because I know I can usually find the girls if I shake the bag or container. I thought I'd share some of the treats that are favorites for the girls. I know to be very careful of the type and amount of treats that I give the girls. Of course, they would eat treats all day long every day, but I'm selective when they get the treats. I have a special bag of treats in my bedside table (Orijen Original Treats). I like these treats for the girls because they are freeze-dried and 10 of the 11 ingredients are protein. I also keep a bag of these treats in my office and living room because when all else fails, the shaking of this bag will usually get the girls' attention and they will come into the room. Truffle and Brulee also love freeze-dried chicken and turkey (Whole Life, Cat-Man-Do Life Essentials, and Halo Liv-a-Littles). These treats are freeze-dried treats where the main ingredient is chicken. The Whole Life treats and Life Essential treats are made of one ingredient only - chicken. There are no fillers or preservatives. The Halo Liv-a-Littles include a few extra ingredients in addition to the chicken. I have some concern that these treats include sodium phosphate, salt and carrageenan. These are the first freeze-dried treats I ever fed the girls and they still like them. I'll usually buy the large bags of Whole Life and Life Essentials and put them in the contain from the Liv-a-Littles because the container is a small plastic jar with a lid. The good thing about all of these treats is that the left over dust can serve as a topper on the girls canned food when they need incentive to eat. One of the newest treats the girls love are the Fancy Feast Duos. I received some samples of these treats from a Purina media social at Global Pet Expo. I brought them home to the girls and they can't get enough of them. There are a lot of ingredients in these treats and they aren't as rich in protein as the other treats they are fed. The recommendation is 1 treat per 1 pound of body weight, but not to exceed 10 treats per day. These treats are in my hall bathroom! When I come home from being gone for several hours, my first stop is usually this room. If I have the treats in there, I know the girls will come out from hiding and I know where they are! I know most people wouldn't consider a supplement for hairball control a treat, but Truffle and Brulee love their Tomlyn Hairball Remedy. Their favorite flavor is Catnip. Most cats will shed fur and lick a lot of fur, especially during the change of seasons. Truffle and Brulee are silver-shaded Persians and do tend to get hairballs because they have so much fur. I need to supplement their diet with a hairball control product and the Tomlyn Hairball Remedy get is the best I've found. The girls love this gel. They will lick it directly from the tube. I have to be careful when giving this to the girls because if they get too much, it will get in their fur and make a huge mess. I tend to squeeze out a little bit and let them lick to their heart's content until they've consumed enough to help lubricate their system. I was not paid to talk about these products. These are products I purchase and use with my cats that I wanted to share with you. We do receive products from time to time to review and some of these products become favorites and are a regular part of our daily lives. We hope you enjoyed this "Tongue Out Tuesday" as the girls enjoy their treats. We love treats and think we don't get them enough as we should. Looks like some yummy fun girls! Well now, I need to talk to Mom Peggy about keeping treats in every room here! Treats are a fun thing, but choosing the right ones that are more healthy is key. Nicky used to love the hairball remedy. He'd eat it like candy if TW let him. Mom has treats in various places...we keep trying to figure out how to get to them ourselves! Now I'm hungry! Where are my treats?! I have to lock up treats. Midnight literally broke through my pantry door to get to treats. He can also open containers. The mayhem girls are still small enough to get pretty much anywhere and Mocha is a really awesome climber so just up high stopped working a couple months ago when she figured out how to get to the top off the bookshelf. Lexy is treat motivated, and sometimes I am. But Mommy is cheap with the treats and they're locked away in the kitchen cabinet. That's because Lexy can open them, and because she's on a diet. I love the picture of Truffle with her paw on your arm...so adorable!! My cats were never motivated by treats, or I should say the only brand they were ever interested in was Dreamies. No matter what I tried they had no interest, but when they heard the shaking of that pouch they would come running. They did love their furball gel though! Layla loves her treats and there is a bag of them in my jacket pocket all the time LOL but I also make hers with ground turkey so she thinks she is getting treats but it is actually food. Truffle and Brulee are so cute. No cats here, but as for my dogs - one of them is SUPER food motivated and one isn't at all. Go figure the one who isn't treat motivated also has more behavioral issues we have been working on with him. We found a few types of food he'll work for, mostly things like chicken and cheese, but I also had to learn how to use other types of rewards with him like toys. He'll do almost anything for a tennis ball! We have treat jars all around the house for our dogs. My sister has a couple of treat jars at her house for her dogs and her cat. I'll have to let her know about these treats. I don't know why ours love freeze dried treats but they DO!!! I love the paw holding your arm steady!!!!! Truffle and Brulee are so beautiful! And they look like they sure are enjoying those treats! Our Huskies l-o-v-e treats and come running at the sound of the treat container or bag!